True decorative or ‘flat ‘ felt (as opposed to felted knitting), in its simple fabric state, is made from either dyed or undyed wool tops. 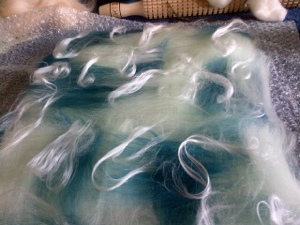 This is pure wool in washed and combed, but not spun, state. 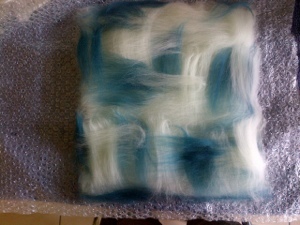 To get some inspiration have a look at World of Wool where you can buy undyed tops from all the most distinguished sheep breeds or dyed merino tops in a vast array of colours plus all the extras to help your creative work. For coloured work the 23 micron size is fine. 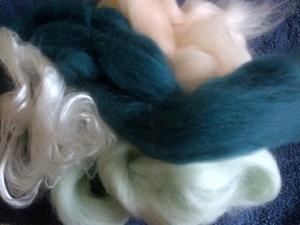 Blacker Yarns also sell carded undyed original breed wool which can be used for felting. 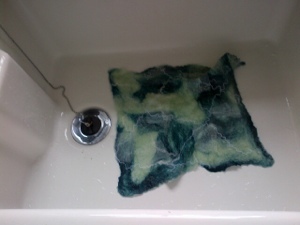 Felt is not difficult to make at home. It does not require expensive equipment and it can be turned to all sorts of purposes and decorated, embellished, reshaped or retextured in many ways. It can then be made into jewellery, bags, clothes, slippers, decorative pieces and three dimensional, and household, objects. For the textiles artist it is an endless source of fascination. The equipment required is not expensive. 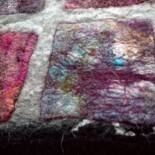 The rolling process required to turn wool tops into felt is known as fulling. 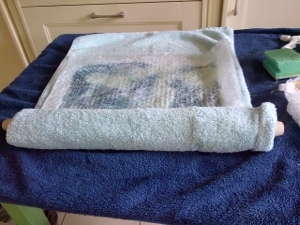 To do this at home you will need to roll your piece when the fibres begin to knit. For best results this doesn’t mean only rolling on it flat as you would with a rolling pin but also rolling it up around something and then rolling it. The best option at home is to use pieces of polystyrene pipe lagging which are light polystyrene tubes which you can obtain from DIY shops. These are soft on your arm muscles. 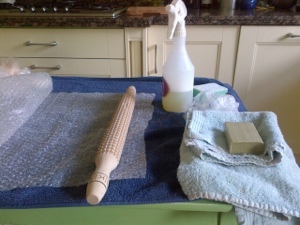 Alternatively, you can use a rolling mat available from World of Wool and use this in combination with your cookery rolling pin or a purpose bought roller. You can add in threads of wool or silk, different colours of wool top, special textured types of wool such as neps and bamboo (more later), small pieces of fabric made from natural fibre or other bits of felt (more on these later). 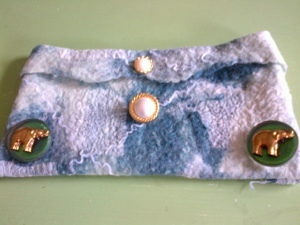 For a first attempt I suggest using only wool tops of different colours and threads of wool or silk in order to learn technique. fetch your wool tops and decorative bits and turn on the radio! : lay a fine layered mat by laying a section with over-lapping fibre ends and the fibres going in vertical direction, then another section to its side, and so on, until you have a thin mat. 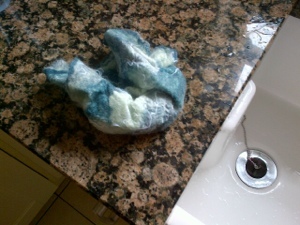 : lay a second layer with fibres going horizontally. : lay a third layer with fibres in the original orientation. A small first piece can be used to decorate a small table or dressing table or can be folded easily into a purse shape. Add a pretty buttton closure and sew the edges. As a fan of buttons, I often start with a button in mind and centre my colour scheme around that choice.